One of the key points to remember when it comes to medical laundry is that it is not always safe to wash at home. Normal wash cycles may clean your scrubs, but that does not mean they will be sanitized. There is a specific process for removing the remnants of any pathogens that may have become attached to the laundry. In the majority of hospitals, there are departments called infection control and they are tasked with washing hospital linens. Their formula for sanitizing linens relies heavily on the use of chlorine bleach. That is combined with hot water and a high intensity wash. However, the wrong combination could cause issues. For example, too much chlorine could lead to skin irritation and rashes. It is also important to note that not all bleaches are the same. Bleaches that are oxygen based do not fully disinfect when used in a household washing machine. Oxygen based bleaches may clean thoroughly, but they do not sanitize everything. And this cannot be used on colored medical laundry. When it comes to colored scrubs, a disinfectant of the pine oil variety will prove effective. This should be used in combination with hot water. This disinfectant should be added at the start of the wash cycle. There are different pine oil varieties and for the disinfectant to be effective it should be mostly comprised of pine oil, with a suggested minimum of 80%. Another option when washing colored scrubs is a disinfectant of the Phenolic variety. This can be poured in during the rinse or wash cycle. Following up with machine drying will enhance the sanitization process, eliminating any lingering viruses. One of the most critical components of this process focuses on eradicating microbes. Hot water helps in this process, although not all homes pump out water hot enough to get the job done. Water that reaches up to 140 degrees may do the trick, but this is often beyond the temperature in a household setting. There are washers equipped with a sanitizing cycle, but this is not common in most homes. Therefore, it is important to use the right kind of detergent or visit a commercial laundromat. The most effective detergents do not rely on water temperature as modern brands are now made with more potency. For an additional measure, ironing medical laundry can be the final touch on the sanitization process. But the importance of the detergent should not be discounted. For a professional uniform cleaning, contact a Spintastic Laundromat today. 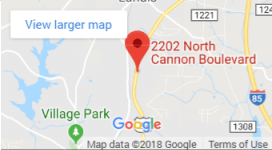 They utilize the best commercial laundry equipment and techniques to provide outstanding laundry services in Charlotte and Kannapolis, NC. When it comes to doing laundry, there are some stains that are more difficult to eliminate than others. Some stains leave behind an unpleasant odor, which is equally difficult to remove. And there are even some stains whose origins are a bit of mystery. The good news is that there is a way to make all those odoriferous stains fade away. The problem with paint is that even though the color may be removed from your clothing, the chemicals still manage to seep in. The chemicals are made up of compounds that attach to the fabric of our clothes. Those compounds are so strong that something is needed to break them down. A similar premise applies to other types of mystery stains that continue to have a funky smell. First and foremost, it is important not to use any kind of bleach when removing paint odors or other chemicals from clothing. The combination of bleach and other compounds could create fumes that are hazardous. A commercial laundry service may ask you to identify the composition of the stain for best results. The initial step in ridding those odors is to give your clothes a thorough rinsing in cold water. Then, it is time for the age-old remedy of baking soda. Add a cup of baking soda along with a heavy-duty detergent and this combination will attempt to break down those compounds. For stains that are more severe, try using ammonia in place of the baking soda and wash in warm water. Also, be sure to leave plenty of room in your washing machine. You want water to penetrate the stains from all angles and fully inundate the clothing. And to be on the safe side, let those clothes air dry. You don’t want to inadvertently start a fire by having some chemicals go up in flames while on high heat. Once the clothes are dry, drop them into a bucket of cold water. Add a cup of baking soda and let them sit out overnight. And if the clothes still have an unpleasant odor, drop them into a sealable bag with some baking soda and set them out in the sun for a few days. This will allow the baking soda time to absorb all those nasty little compounds that are the source of those unpleasant odors. Last but not least, one of the oldest solutions is prevention. Try to remember to wear some old clothes when you are painting. When you are done, discard them or save them for next time. When in doubt about how to do laundry, go to a Spintastic Laundromat near you. Our staff is ready to provide top-quality laundry services including commercial pick-up and delivery, flip and drop off services.